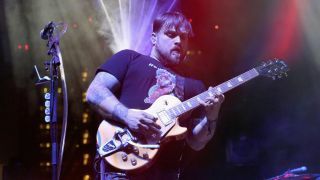 Coheed And Cambria's Travis Stever: "There are a lot of different guitar sounds on this record… I love the whole world of experimenting"
Coheed And Cambria were either born too late or too early. Here is a band whose oeuvre has been constructed around the fictional sci-fi narrative of The Amory Wars comic book series, written by the band's guitarist and frontman Claudio Sanchez. Its stories are given life through a brand of epic songcraft that resists the fidgety 'What's next?' attitude of the information age, a progressive sound whose designing principles could well be carbon-dated to the febrile rock scene of '70s, but whose execution feels very much of our time. And maybe just ahead of it. Their first album in three years, The Unheavenly Creatures, invites the listener in to divest themselves of reality for 80 minutes. Relax, it'll still be there when you get back. Returning to the Amory Wars universe, the album plays out as a mind-bending cornucopia of riffs and urgent melodies that tells the tale of star-crossed lovers. But whatever cosmic energy is driving the whole thing along, guitarist Travis Stever is very much of this world, too. His pleasures are earthly, ones we can all relate to here; we're talking large valve amplifiers, boutique effects pedals and the primal joy of playing a Gibson Les Paul. As Stever explains, for Coheed And Cambria to make a progressive sound work in the here and now, it's all about balance, about dosing the song with hooks and riffs, making it relatable. Hey, the story might be set amongst the stars, but Stever promises it'll make sense on Planet Earth, too. The new album, Vaxis - Act I: The Unheavenly Creatures, returns to your fictional Amory Wars concept and, again, it shows that for you there is very little difference between songwriting and storytelling. "Absolutely. I think that the best songs do tell a story and with Coheed there's the real-life experience within each song and there's also that other depth of the actual concept running through it, and that has always been a part of how Claudio writes lyrics and also how we like to perform the music. "And even with The Color Before The Sun, our last record, even though it wasn't involved in this conceptual world each song had a very in-depth storyline to it, having to do with real-life experience. There's no doubt that's always there. It's just that it goes a little deeper with the records that have to do with the Amory Wars." Are you conscious of this balance where you create long-form music in a short-form media environment where attention spans are shorter, or more aggressively fought over? "Balance is the most important thing for us. Absolutely. You know the song is just as important, and the melodies - every part of what we do is just as important as any conceptual side. Sitting in the studio and doing this record ourselves, it was like everybody was just involved in hearing everything and getting their opinion on whether an idea helped the song or if it took away from it. "No matter what, the song is the most important thing and how it feels with the rest of the record and how it will sound on its own." What's your songwriting process like? Does Claudio come to you with the music and then it's a case of you adding to it? "Yeah, we'll try to add to it the majority of the time. There'll be sometimes those exceptions where I'll go work with him, and maybe I have a riff, and we'll go work from that. "There's one song on particular on the record that we did that, which is called Night-Time Walkers, but for the most part it was that he had all the songs, pretty much arranged the way he wanted. I don't even think there was any arrangement to do once we got in the studio. It was more just each of us adding our melodies and our flavour to each song." You produced this yourselves, which gives you complete control. But that invites its own pressures. How did the sessions go? "Well, interestingly enough, I have felt that most Coheed records have been self-produced in a way because we have never come in without the material being pretty-much hashed out, no matter what the record was. So we are a prepared band in the first place when it comes to coming in ready to perform and record, and knowing what we want, or having a clear idea of what we want the actual music to come out as. "In that way it wasn't very far off of an experience that we've already had, but there have been producers who we have worked with whose finishing touch has been there - you can tell in the product. For this [album], that's what makes us so proud; it just fully represents in every way, sonically, what the band is, because it's self-produced. "When it came to the dialogue in the studio, it was just that everybody would put their opinion in on each and every melody. It's leaving your ego at the door and saying, 'Okay, what's everybody's feeling?' But I'll be able to experiment and come up with something new now, and that goes for each individual [in the band]. In the end, it turns out to be a real team effort." It was interesting to hear Claudio say that maybe he felt like this record was a reset for him creatively, that it makes him feel young in a sense. Is this something you felt, too? "I needed it. I can definitely relate to that feeling because I needed it. We had not performed for a year and we had not been active, and I need that outlet of creating, and so the album came at a perfect time for me when I'm trying to get over some humps as I'm getting older; real-life stuff, having kids, stuff like that, and music is such a part of my life that if it's not there in the form that I am so used to, which is performing and creating and actually being out and being onstage, you feel lost. "And so being able to have this fresh, new creation to get involved in and come out here and be able to perform it, it's almost life-saving in a way. Because if you feel too stagnant you start to feel... Well, maybe that's dramatic! I don't mean to say life-saving, but it's definitely something that creates a new era in my life. How about that? It created a new me, if you will." Gear-wise, what did you use? "I pretty much used my Goldtop Les Paul. It's a newer Goldtop but it's a traditional model and I use that on pretty much every song. We had an array of pedals. Claudio collects a lot of effects pedals. And I had a couple with me as well. We just had this huge selection of effects pedals. "I had my Mesa Mark V head. We had a Marshall JCM800. We had a Bogner Uberschall. We had a Fender Twin Reverb... Orange. Y'know, pretty much, across the board we had as much choice as we could have for each song." How did you deploy all those amplifiers? Did you layer them, with maybe one track through a Marshall, and other through the Mesa/Boogie, or was it determined by the song? "I chose by the song. We decided together how it was going sound-wise, what Claudio was using for rhythm. I think for a lot of the lead stuff really we'll only double it if it needs that extra kick but a lot of the leads were just single-tracked. But there definitely are doubles and we'd find a different sound for that, but for the most part it was finding the best sound for my lead and sticking with it. "For part to part, though. I will say that. It depends. There could be a part in the verse that really works for some overdriven delay sound and all the bits in between are a little bit more washy, where a reverb sound works, so I definitely would mix and match that. "And live, performing that, it's just about finding the balance and then recreating it. But it goes back to what paints the picture of what's going on in the concept and what works for the song - the balance we discussed." And for live performances, will you still be using your Fractal Axe-Fx? "Yeah, we're still using them. The possibilities are endless with those things, and so creating a sound has proven to be really quite easy, easier than I thought. Trying to recreate this stuff is not as difficult as you might think." Well, we guitarists are simple creatures. Easy is good. Are there many effects on your rhythm tone? "No, I think if there's anything rhythm-wise that I'm playing it's mostly just overdrive. There are a lot of boutique pedals, so we did have an overdrive pedal that somebody had created that has a particular sound to it, and that's the cool thing about having all these different pedals. "Going back to the guitar player line that we are simple creatures, it's also that we get excited, and you've got to move really fast. If you are a guitar player you'll understand that, especially when you are creating, you move really fast and you're like, 'Wow! That sounds amazing!' And you don't even take into consideration what tools you are running through, the pedals; you just record it and you move on. "Funnily enough, we did take a lot of notes in the studio. We would actually take notes on a pad, so somewhere there is a notepad that has every pedal written down." Was there any one pedal that was a big discovery for you? "There's a few. I'm trying to remember. There are a few pedals that, not to sound ignorant, but the clicks and bloops are in there. They're happy accidents in a way, and I'll just be playing, like on the song Black Sunday, there's a middle part where you can hear the guitar going in and out. "Actually, the chorus itself is a great example because there's one track of me playing my lead and there's another track of me playing my lead with Claudio playing [a pedal]. I'm trying to remember what pedal it was... Oh man! It was not the Bit Commander, because the Bit Commander is just a regular [on the pedalboard], but it's one of those that goes in and out and almost makes the guitar sound like it's eight-bit. "Wow, I can't believe I am forgetting this! But Claudio was playing with all the knobs and I would perform my part and it would do these really cool sounds, so basically I am playing to what I already did in a sense that it's there, you're not going to lose any of the melody per se because the melody is there already, but you're gonna get these extra awesome notes and sounds because we are performing a double of it. That's an example of a happy accident. The notes peeled off in different ways, and that's in that chorus. There are a few parts like that." You always have to keep the ear open to happy accidents. And it's a sign of experience being able to recognise when they're going to work on record. "Yeah, well Josh [Eppard, drummer] always jokes that for me, personally, when we were younger, back in the Second Stage days, that I was adamant not to use anything! [Laughs] I'd just be like, 'No! Overdrive is fine but I'm not into effects and pedals.' I've completely changed on that. I love the whole world of experimenting." Going back to storytelling in music, who would you say were the best storytellers in music? "As far as I'm concerned, Yes, Pink Floyd and the Beatles, and of course, even Rush. They weren't as big an influence on me when I was younger but now I respect how their storytelling and their lyricism is so genius in its own way. And even newer bands who did concept records later - even the Damned, a band that I loved, did The Black Album - and the concept albums have always been there, but, for Coheed, it's not just the concept record; it's that we really try to tell the story cinematically, like it's a movie. Or like it's a Broadway play in a sense." The Unheavenly Creatures is out on 5 October via Roadrunner Records.